Stay in one of 89 guestrooms featuring flat-screen televisions. Complimentary wireless Internet access keeps you connected, and digital programming is available for your entertainment. Private bathrooms with bathtubs or showers feature designer toiletries and hair dryers. Conveniences include phones, as well as safes and desks. Beloved by aristocrats and even royals in its heyday, the small seaside town of Frinton-on-Sea still feels like an Edwardian resort. The town was a hamlet until the 1890s, when it was developed into a seaside resort, and has remained largely unchanged ever since. 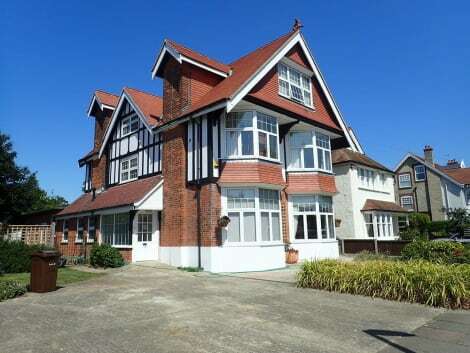 Book one of our Frinton-on-Sea hotels and explore the tree-lined avenues, Art Deco buildings and stately esplanade of a town which didn't even have a pub until 2000. Lined with colourful Victorian-style beach huts, Frinton's sand and shingle beach is clean, gently shelving and quiet – there are no arcades or stalls here. The beach holds a Blue Flag award and is popular with windsurfers, swimmers and sailors as well as families. Between the beach and the esplanade is a large green, known as the Greensward. Founded in 1899, the Frinton Lawn Tennis Club was the town's main social venue in the early 20th century and was one of England's major tennis venues. The club has 16 grass courts, eight all-weather courts, two squash courts, an outdoor heated pool and a fitness centre. There's also a 25-metre indoor pool in nearby Walton-on-the-Naze, with a flume and a shallow area for children. Frinton Golf Club, founded in 1895, has two courses, an 18-hole course and a nine-hole course, as well as a bar and lounge in the clubhouse. Frinton has a good selection of independent shops, with Connaught Avenue dubbed the Bond Street of East Anglia in its heyday. Number 24 Of Frinton is a haven for antique lovers which specialises in Art Deco items – you'll find jewellery, telephones, grandfather clocks, radios, vintage clothing, furniture and more on sale. Great Danes, further down the street, sells home accessories, kitchenware, garden accessories, jewellery, scarves, bags, toys and more. Caxton Books and Gallery is an independent bookstore which also exhibits work by local artists, including paintings, ceramics, jewellery, photography and glasswork. The shop was the regional winner of the Independent Bookshop of the Year award in the 2015 Bookseller Industry Awards. The marshy 1,448-hectare Hamford Water National Nature Reserve is a globally important site for birdlife, especially waders and waterfowl. Nationally important colonies of little tern and avocet breed here, and you might also see black-tailed godwits, redshank, ringer and grey plover – as well as common and grey seals. The reserve is also one of only two places in the country where you can find sea hog's fennel, one of Britain's rarest plants. Enjoy French classics, English dishes or just coffee and cake at Franck's, a family-run TripAdvisor 2014 Certificate of Excellence winner whose eponymous chef was classically trained in France. Head to Emma's Kitchen Café, also family-run, for lunch, afternoon tea or an English breakfast – or just enjoy a coffee in the kitchen and chat to Emma while she cooks. Frinton's first pub, the Lock and Barrel, serves food too and has two courtyards and a fire in winter. The family-run, family-friendly Café 19 has a kids' menu, high chairs and baby changing facilities, and the extensive menu features everything from homemade pizza to ice cream milkshakes.